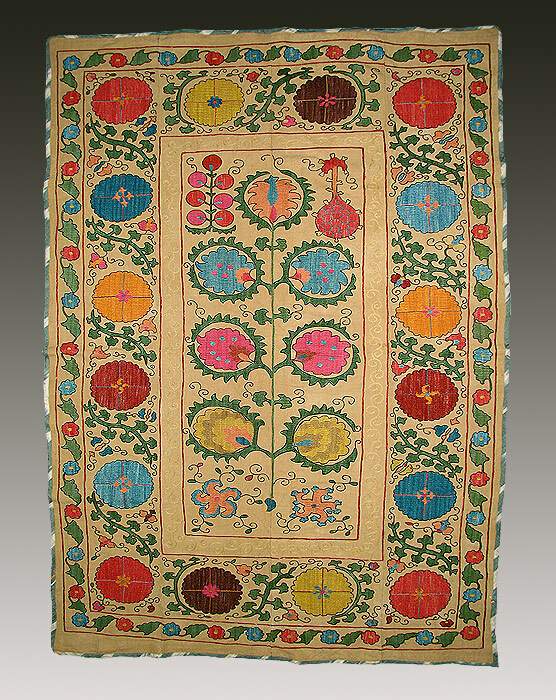 Chapan, coat of long panels of silk warp ikat, from Bukhara. Arrive May 3, depart for home May 19. THIS TRIP IS FULL. Sorry. We will offer another trip in 2020, so check back here in a week or two. Our 16-night all-new textile tour of Uzbekistan checks another fabulous adventure off your bucket list! 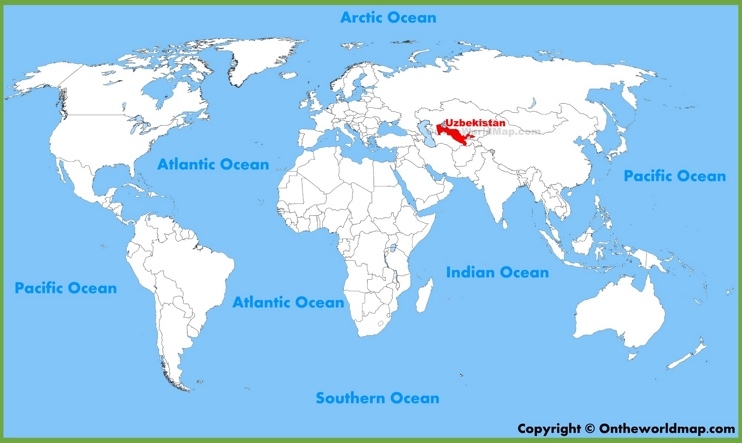 Uzbekistan was an important trade center on the Silk Route, the ancient trade route linking China to the Mediterranean. 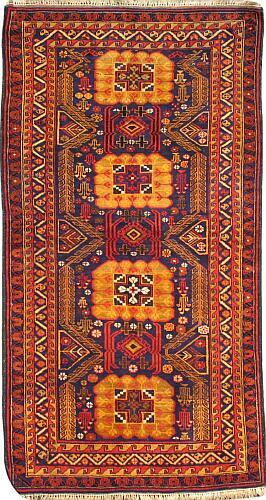 And the textiles of Uzbekistan are stunning. It’s home to exquisite, handwoven silk ikats (right) as well as four UNESCO World Cultural Heritage Sites. 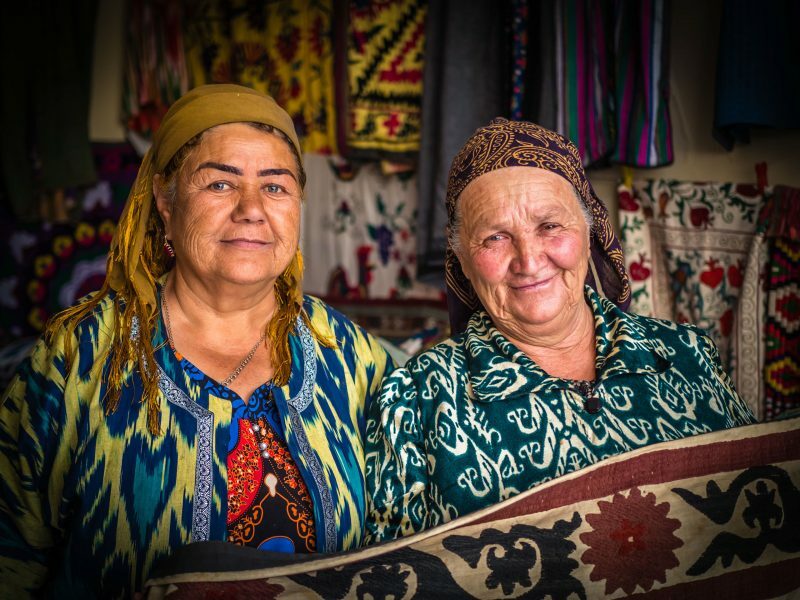 An Uzbek native textile expert will accompany our small group during the trip to be sure we meet the most talented artisans, and see the best textiles and most stunning architecture. The trip begins and ends in the exciting city of Tashkent. Along the whole route, we will visit exquisite blue-tiled madrasas and museums, as well as bustling handicraft bazaars. And true to our name, everywhere we’ll go ‘Behind the Scenes’ to meet silk ikat dyers and weavers, wood block printers, embroidery and ceramic masters, and more. Next we’ll head for the Ferghana Valley, home of the most renowned ikat weavers. Over the course of four days there, we’ll visit many artisans, the textile bazaar and a silk factory. We’ll also learn to make some authentic dishes in our cooking class. Later we’re off to Samarkand by fast train. This interesting city lies right on the Silk Road. Seasoned travelers consider Samarkand as one of the most beautiful cities in the world and we shall see why. Inside dome detail of intricate glazed ceramic tile work. Next we’ll visit Bukhara, a UNESCO World Heritage site. We will travel there either by car or via the sleek, new train, if it is up and running. Blue mosques and textile bazaars also abound in this fabulous historical city. Next we drive to Khiva, skirting the Kyzylkum or Red Sand Desert, to see its wondrous architecture and carpet knotters before heading back to Tashkent for our last day. Next morning on May 19th we’ll head to the airport for our homeward bound departure flights. Some convenient flights will be suggested. Depending on what time you arrive, we’ll eat lunch and/or dinner as a group this first day. 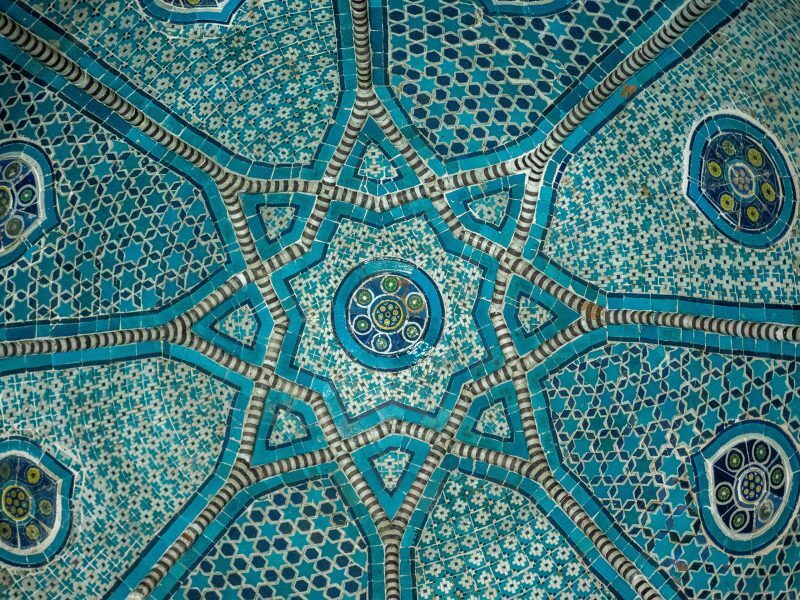 In Tashkent, we’ll also admire the turquoise-tiled domes of the historical buildings such as the 16th Barak-Khan Madrasa complex. While in the old city, we’ll also visit a famous woodblock print studio and an embroidery workshop. 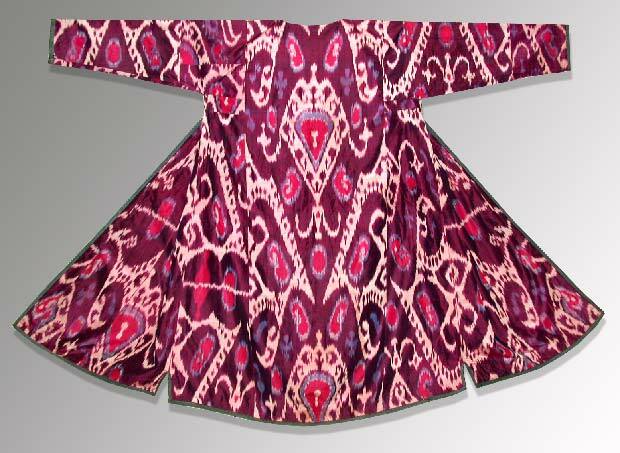 The State Museum of Applied Arts showcases some of the best historical artistic examples of the textiles of Uzbekistan. Long ago, the Imperial Russian diplomat Alexander Polovtsev built a mansion to display his extensive collections of unique national handicrafts. After the Soviet revolution, the government nationalized his cherished home opened it to the public as a museum. Polovtsev’s rare examples of folk art such as rugs and wood carvings are on display here. 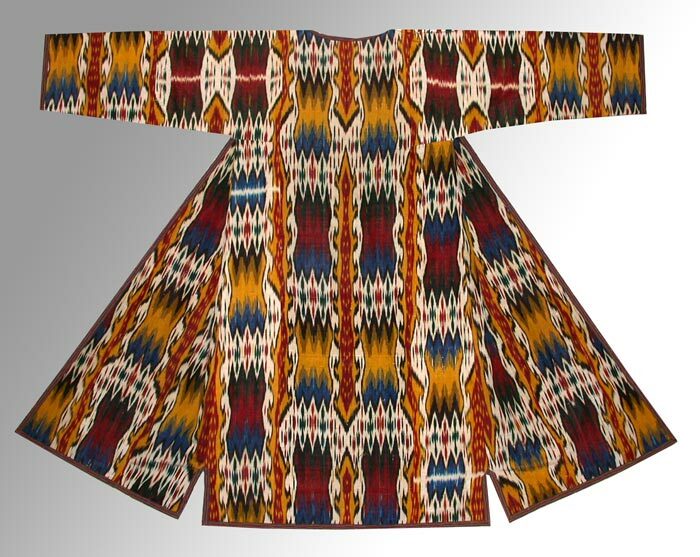 Collections also include traditional ikat weave garments. The museum often holds exhibitions and sales of works by contemporary Uzbek artists. 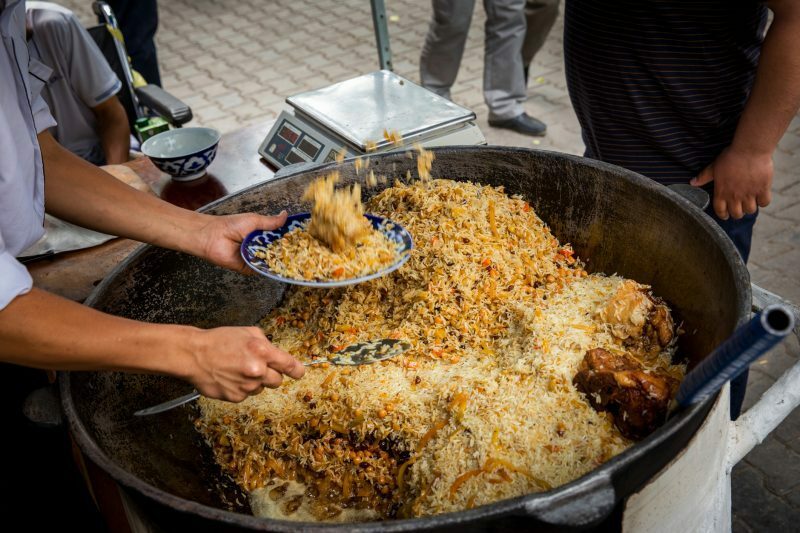 Serving the national dish of rice and lamb, called plov. Our route to Ferghana Valley leads us via the low Kamchik pass at around 7400 feet. After 4 hours drive, we’ll stop in Kokand, to visit the incredible Khudayarkhan Palace and the Juma mosque, and to eat lunch. Taste the delicious homemade honey halva sold in the mosque courtyard. In Margilan, an ancient Fergana Valley city, we’ll meet ikat dyers and weavers who are the most skilled in Central Asia. Margilan was already well known in antiquity for the superb quality of silk was created here. A highlight will be the Kumtepa Bazaar, one of the best places to buy ikat fabrics (with resist-dyed warp) which are the most renowned textiles of Uzbekistan. It’s a great local market with an extensive area devoted to local textile crafts. Here you can buy ikat yardage to make robes, quilts or pillows, and other textile treasures. There is also a workshop where you can buy the ikat fabrics directly from the weavers. Later we’ll visit the training center of the most renowned ikat weaver, whose workshop did custom work for Oscar de la Renta. We’ll visit the Yodgorlik Margilan silk factory, established in 1972. Today about 450 people, mostly women, work there, and the visit is fascinating. Every month the factory produces about 6500 yards of fabric including natural silk and silk blend fabric. Over the course of our four days in the Ferghana Valley, we’ll visit many other artisans, the textile bazaar and a silk factory where we’ll witness the entire process from silkworm’s cocoon to the finished ikat. We’ll also learn to make some authentic dishes in our cooking class. From Margilan we go back through Tashkent, then we’ll board the fast train to Samarkand, today the third largest city in Uzbekistan. Once the capital, and an important trade stop along the Silk Road, Samarkand sits at the center of the country. UNESCO included Samarkand in the list of the World Heritage of Humanity almost twenty years ago. 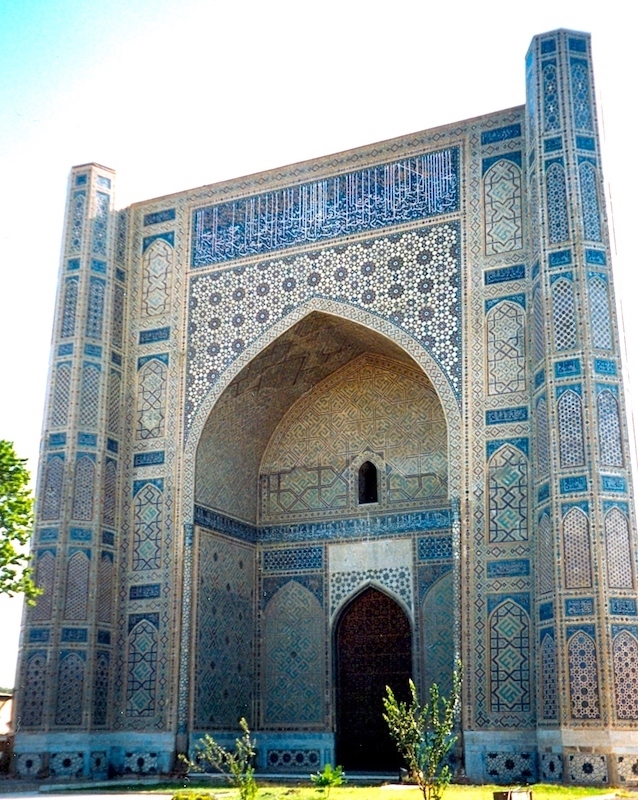 Samarkand was at the forefront of Islamic architecture, witnessed in the old town built in typical medieval fashion. There, numerous mosques, madrasas and homes line the narrow streets. We can visit a silk carpet factory, the famous Afrosiab museum and the Observatory of Ulughbek. Prominent landmarks include the Registan, a plaza bordered by 3 ornate, majolica-covered madrasas dating to the 15th and 17th centuries, and the towering tomb of Timur (Tamerlane), founder of the Timurid Empire. 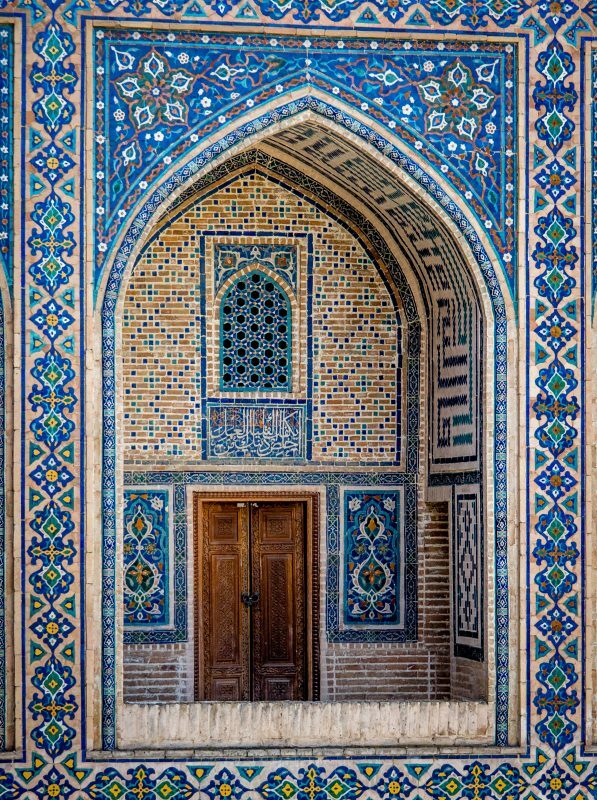 Modern Samarkand is a unique city: it combines the spirit of modernity and old historical grace. The western part of the city is more modern, with architecture reflecting 19th and 20th c. European design and style, influenced by the Russian aesthetic. The city is often referred as a crossroad of cultures. The ancient city of Bukhara remains an exciting place to explore the architecture and textiles of Uzbekistan. This city has amazing mosques, galleries and museums. The age-old caravansarai and madrasas have often been converted into artists’ studios and workshops. And several ancient, domed bazaars here offer carpets, suzanis (embroidered panels) and jewelry. We’ll explore these as well as an artisan center where we can learn how some typical crafts are made. While in Bukhara, we must see the Emir’s summer palace, Sitorai Mohi Hosa. It’s an ‘over-the-top Russian/Central Asian confection built in 1911.’ The palace also houses the excellent Bukhara Museum of Decorative Arts where the suzani collection will enthrall the embroidery lovers among us. The main building houses royal furniture of the 19th – 20th centuries, Japanese and Chinese porcelain, palace artifacts from Russia, and jewelry by well-known Bukharan masters. At the center of the garden there is the octagonal pavilion, with an exhibition called the ‘Clothes of Urban Dweller of Bukhara in the late 19th and early 20th Centuries.’ The exhibition includes an interesting collection of wealthy citizen’s clothes, belts, scarves, and shoes decorated with gold embroidery. We’ll visit other architectural wonders such as the 9th century Ismael Samani Mausoleum, a perfect cube made of baked bricks in basket weave pattern. Onward from Bukhara to Khiva! This is a long drive, but the desert landscape is compelling: vast steppes, shepherds and their flocks, odd villages, military outposts and unusual vegetation. We’ll cross the Amu Darya river, known as the Oxus in ancient times. Ichan Kala, the walled, ancient, inner city of Khiva made an important stop on the Silk Road. 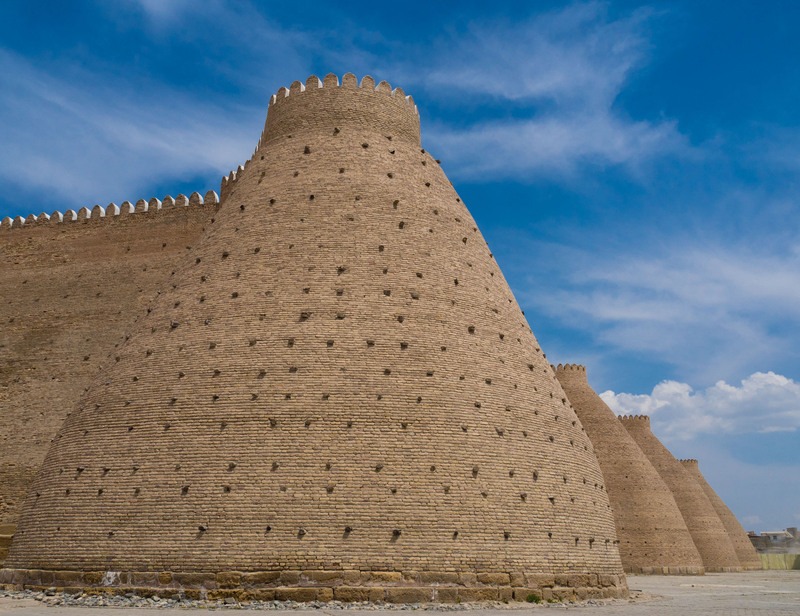 Traditionally known as Khorezm, Ichan Kala was declared a UNESCO World Heritage site and also the largest surviving walled city in the central part of Asia. Once famous for its ruthless emirs, Khiva is now touted as the most intact and remote of Central Asia’s silk road cities. Today it’s considered the most homogeneous example of Islamic architecture in the world. The city’s rulers, the Khans of Khiva, originally built the wall to keep out colonial threats. However, Itchan Kala was later preserved by Russian colonial rulers. Nearly sixty largely Islamic historic monuments are preserved in the old city, as the State Historical Archaeological Museum. These tiled and mosaic-encrusted treasures include palaces, mosques, minarets and pillars. Textiles abound in Khiva. We’ll visit another spectacular museum of handicrafts, and several grand architectural wonders. There is a particularly wonderful carpet shop in Khiva also. Hand-knotted examples here show patterns that were inspired by the designs of the tiles and doors of the city. 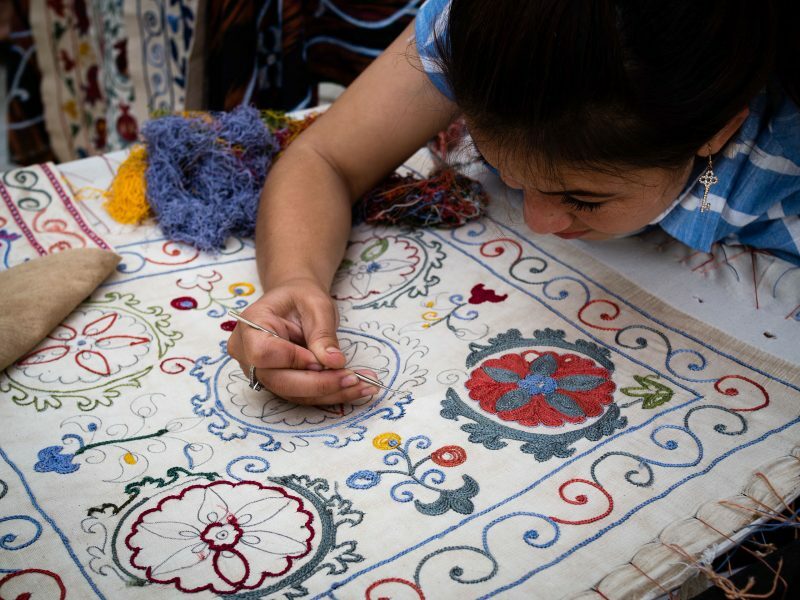 One exciting visit in Khiva will be to the Khiva Suzani Center to see stunning embroidered examples from all over Uzbekistan, below. Bread sellers showing off decorative stamped designs. We’ll eat delicious food everywhere and learn about the local cuisine in at least one cooking class. The diet includes grilled meats and stews such as pilaf or plov, with lamb/mutton. Usually cooks serve Uzbek meat dishes with vegetable kebabs and fresh salads. Traditionally, lamb is the most popular meat among Uzbek people; They don’t eat a lot of beef but people of coastal regions naturally catch and consume varieties of fish. 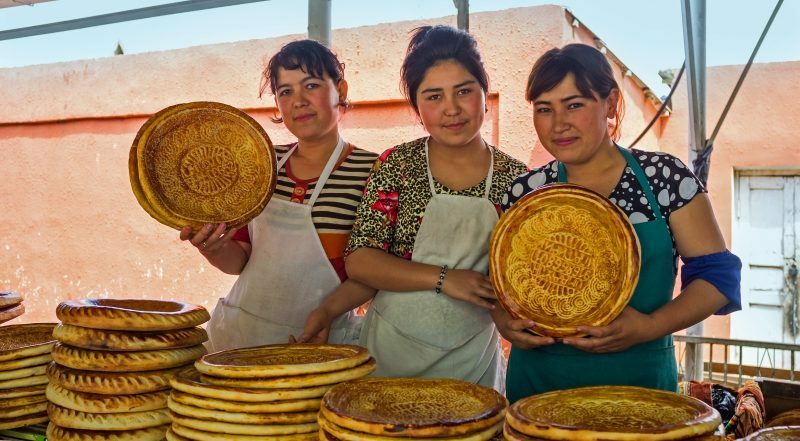 Bread is considered sacred by Uzbek people. 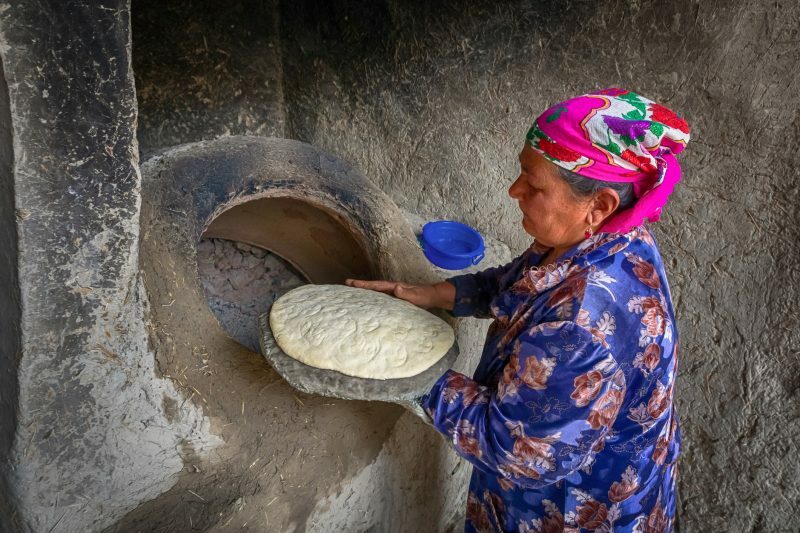 The traditional round and flat bread, called non or lepeshka, and is baked in a tandyr/tandoor (clay oven), after which it comes out toasted and crispy. Bread of each region has own particular method of leavening, its own baking techniques and its own inimitable taste. For instance, delicious flaky bread – katlama non, each layer smeared with oil or sour cream – typifies the Fergana Valley version. Some lepeshkas are prepared with onion or meat, baked inside the dough. Traditionally Uzbek dinner guests never cut bread with a knife. At the start of the meal, they break the bread into pieces by hand and place it on the table near each place setting. And they take care not to act disrespectful by setting the bread upside down on the table (with its flat side up). We will learn about the cusine as well as as the polite Uzbek way of dining. Two evening meals will be on your own, to lounge at the hotel with a picnic of bread, cheese and fruit, or to find an interesting place to try. On May 18th, at the end of our adventure, after seeing a million suzanis and ikats, we’ll drive to nearby Urgench for early flights back to Tashkent. Today is a free day to explore this city on your own — to see something you missed the first time, visit more museums, hit a 6pm performance at the Theater of Opera and Ballet, or visit the local Chorsu bazar for some final gift treasures. Or just relax at the hotel and organize your luggage. Lunch on your own. Pack up bags tonight, before our Farewell Dinner. May 18th is the last included night of hotel accommodation. On May 19th we’ll fly home. We will suggest some convenient flights. Accommodation in double room with private facilities. All breakfasts in the hotels. Entrance fee to all sites and monuments. and Bukhara (and Bukhara-Khiva if launched by 2019). Transfers Samarkand railway station to downtown. 1 liter of bottled water per person per day. Tips for guides and driver. Photos # 2, 3, 7, 8, 9, 14 by Kathleen Walsh.